I wouldn’t call myself particularly experienced with the magical girl genre. In fact the only examples of it I’ve seen any of are Madoka, Nanoha and (if you can call it a magical girl anime) Kill la Kill. 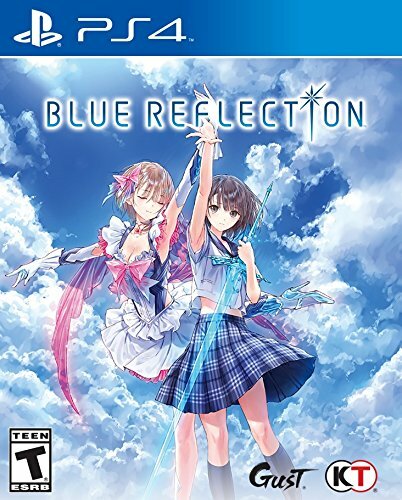 Regardless, I decided to take a shot at Blue Reflection, a game that is in essence a magical girl anime made into an RPG. It was announced alongside Nights of Azure 2 and Atelier Firis, both other series with which I have no experience. So, as a relative newcomer to both magical girls and Gust’s games, I ventured into Blue Reflection. Blue Reflection follows protagonist Hinako Shirai, a high-level ballerina who injured her leg in an accident a year prior to the game’s story and will never be able to dance again. After being accepted to Hoshinomiya Girls’ High School for her dancing skills, the story picks up after she spent the first part of the year away from school before joining in the summer. As of the start of the story, she’s incredibly quiet and introverted, on the brink of losing any will to live after losing the ability to dance. Shortly after arriving at the school, she gets transported to another world called the Common, becoming a magical girl known as a Reflector. Joined by previous Reflectors Yuzu and Lime Shijou, she learns that her new task is to collect Fragments by helping her classmates solve their personal problems, in order to become strong enough to fight the powerful Sephira that threatens the world. This is me whenever I chat on my phone. 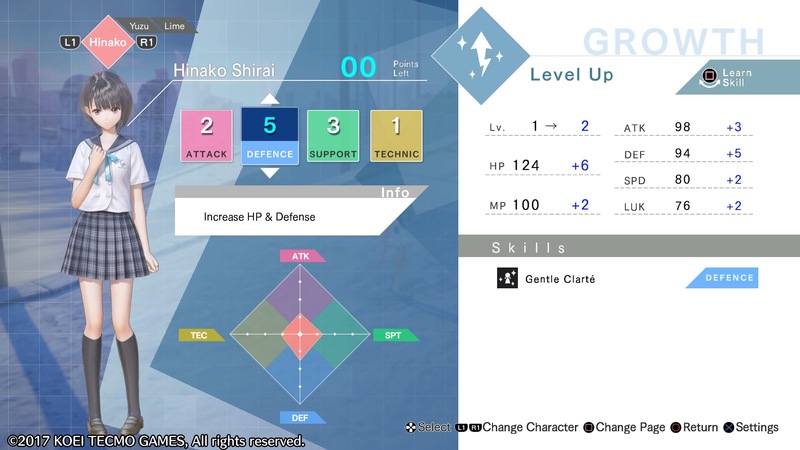 Along the way, she gets to know and befriend some of the students she helps with her power: Sanae Nishida, Sarasa Morikawa, Rin Sanada, Ako Ichinose, Shihori Sugamoto, Kei Narimiya, Chihiro Inoue, Rika Yoshimura, Kaori Mitsui, Fumio Taya, Yuri Saiki and Mao Ninagawa. None of them become Reflectors; improving your friendship with each character gives you Fragments that you can use to improve your main party members’ skills, and they act as support for Hinako, Lime and Yuzu in the boss fights against the four Sephira. Each Reflector can go into combat with up to four supporters, and they will periodically be able to use special skills to buff or heal your party or attack the enemy alongside the equipped Reflector. They also build up the Ether gauge, which can be consumed for certain skills or to use multiple skills in a single turn. The gameplay is divided into missions in the Common – both for the main story and side quests – and free time in the school. During free time you can take on Missions, which often require you to go to the Common and do things such as defeating certain enemies, picking up a certain number of items, or crafting items and going back to talk to someone at the school. Completing Missions gets you items and rating points, and the game requires you to reach a certain threshold of level and rating points to progress in the story. You can also spend time with your supporters, either by inviting them out or by sometimes initiating special conversations to get you new Fragments to equip. Spending time with supporters helps complete an ongoing Mission through the entire game, which gives you growth points to level up as you advance. 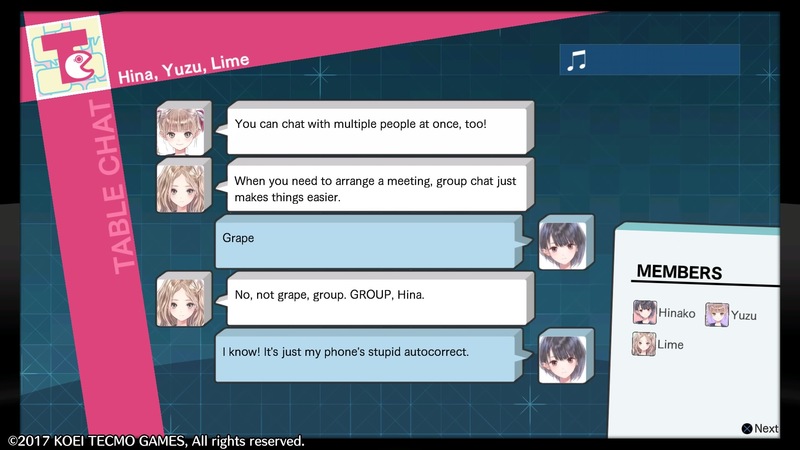 Hinako is so done with everything. Combat is turn-based, with a system similar to the Active Time Battle system found in some Final Fantasy games. Each combatant is moving along a timeline at the top of the screen, and when they reach the center they take an action. Each skill has a set position it sets the user back to after use, and certain abilities have the knockback trait that delays the target’s turn. While the system starts out incredibly simple, it grows more complex as the game goes on and it introduces new elements, such as actions during waiting periods, supporters in the boss fights, and anything using the Ether gauge. However, there are some oddities about Blue Reflection’s combat. Items can’t be used in combat, and the only consumable items in the game provide temporary boosts to health, MP, or any of the user’s other stats, while there are skills to restore not only health in combat but MP as well. There’s also no equipment, and health and MP are fully restored after combat, making it entirely possible at least on normal difficulty to get through the game without using items at all. 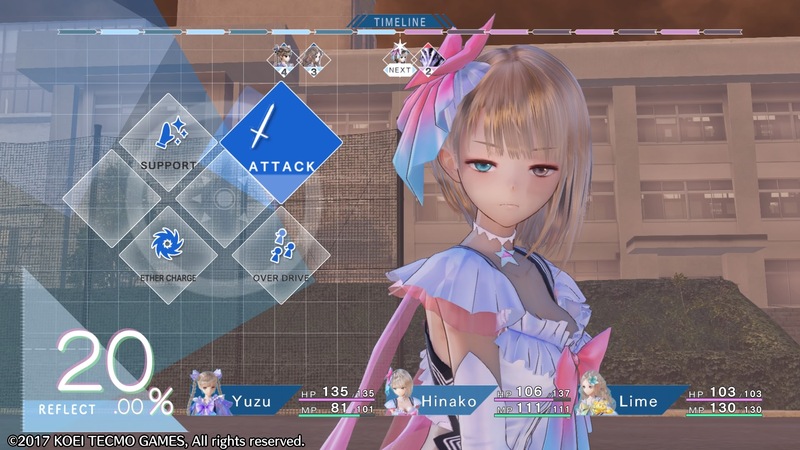 Blue Reflection also doesn’t have any kind of experience system; characters gain growth points which can be allocated to improve certain stats and level up as you progress through the story and build your relationships with the other characters, rather than through combat. It’s an odd way of approaching character growth, since there’s very little benefit to fighting enemies other than removing obstacles and getting items to use with the somewhat vestigial crafting system, which can create new items or improve Fragments. It takes some getting used to when there’s no apparent reward for combat, aside from removing obstacles; it goes with the unusual structure for dungeons, where you reach the goal by finding items in the environment rather than progressing through the area. It adds up to Blue Reflection having a very different feel of progression than other RPGs; there’s only a few distinct areas in the game that you revisit throughout the story and side quests. It’s a different kind of progression than I’m used to; rather than visiting new areas for a feeling of physical advancement through the game, you do different things for people in the same areas as you advance through the story. It also results in a rather disappointingly limited assortment of environments and enemy types, making it hard to feel like you aren’t just doing the same thing over and over again. Although later on you begin to encounter some of the environments mixed together, considering how great the environments themselves look, there’s a disappointing lack of variety. You can choose how you allocate growth points, to unlock new skills and specialize your Reflectors.